It was a really hassle-free experience working with Goutam. His work, be it the designing, the quality of the printing or the delivery of the product & packaging, lived up to the name ( Perfect invites). He was quite patient and was open to the many suggestions I gave. The final outcome exceeded my expectations and everyone I'd sent it to had nothing but praises for the invites. It was simple, elegant and classy, just the way I wanted it. Thanks a lot Goutam! Thank you so much keerthi... it was indeed a pleasure.. Perfect Invites, just like its name is perfect! If anyone is short on time and want utmost quality work, their designs are outstanding - be it ecard or an actual physical invite. Gautam had it completely figured out! I explained him the situation, the time frame (2.5 weeks), our ideas, and background and he came up with the best of ideas possible within just 24 hours. Their team worked overnight, beyond their schedule to make ends meet - who does that in 2017/2018! That wasn't a service they offered, that was, in fact, an exception they made to HELP our wedding be better than the best. Many would think such services would come at hiked prices, these guys I must accept, were like family and friends, it was like a gift from their end. Within 24 hours they delivered the designs, even they convinced us that a physical invite would be possible too. Now since we were based far out in the Gulf peninsula, the challenge they faced was getting the card to us in time. This was also worked out! Despite the designs for the invites we chose were quite complicated, he made it look like it wasn't a problem at all. Gautam then came up with a very elegant and 'Mughal' e-invite which would be sent out directly to the email addresses I would have provided, with their names on the e-invites. He had also made the invites available for me to send them out via mobile messaging too, how convenient could it more get? It was decided the cards would be shipped out directly using express courier given that we had enough time in hand to get them to the right houses. Unfortunately, we were only able to finalise the venues 3 days, yes - THREE days, before the wedding date. At that point we rather decided to convert the physical invites as a thank you card at our wedding where we could distribute them to our guests as a gesture. And, we carried on with the e-invite! Of course, the drama was longer and way more than I could sum up in this write-up, but the point is these guys were the best I could have found. Awesome design, greater support, and the best people I could have asked for. We always kept in touch and they followed up with us even after the wedding - WOW, what a gesture! Destiny paves its path! Thank you so much Mohammed! OMG is all I have to this. From the beginning to the end Goutam was so professional. I told him what I liked and he said he could do it. I live in Canada so I thought it was going to be harder to deal with a vendor from India but Goutam made it so easy. If I messaged him he would reply within an hour and had all the answers to all my questions. He is patient and accommodating. He made the perfect wedding invites and delivered them on time. The payment from my side was a few days late due to wire transfer from Canada to India but Goutam was so patient and not once did he get bothered about it that he didn't receive the payment in time. Everyone loves my invites and my friends and cousins who are to get married have asked for his Instagram page and his contact! I am honoured to recommend Goutam to my friends and family. He did an amazing job with my Invites. Thank you Goutam! Thank you so much Panit! For those who might not want to read the entire review, just READ THIS: Regardless which part of the world you are in, get Goutam to do your wedding invites and you will begin your wedding journey with the right step forward and you will also gain a friend in him :) My review will probably not do justice to the wonderful experience that we had while working with Goutam on our wedding invitation. That's especially since there were too many exceptional things about the experience. Goutam is a thorough professional who takes complete ownership of his work and makes sure that he pays attention to every detail. But what’s more exceptional than that is that he is an absolute joy to work with. More than a vendor, he became a trusted friend that we could consult and be assured that everything will go smoothly. And when we faced hiccups, he was there to help us out. Something that a friend would do for you. Goutam was extremely attentive to our needs and ever-ready with ideas and suggestions. 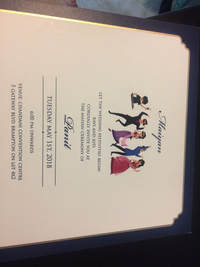 He not only took the time to understand us, but even made the effort to understand the considerations that we had (for example, preferences of older family members that needed to be managed) to ensure that the invites would be loved by all. And his efforts paid off. Every family member and friend that received our digital card as well as the physical card was completely impressed. 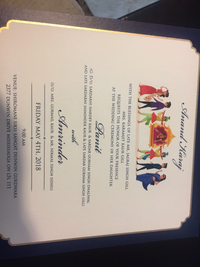 The liveliness of the digital card matched the enthusiasm of all our loves ones and the elegance of the hard copy invite made every guest feel special. From the youngest to the oldest guests, everyone loved the cards which were a perfect balance of being fun while maintaining the elegance. The invites set the exact tone that we wanted our guests to expect from the wedding: a fun and vibrant wedding! I can go on, but I will stop here and emphasise that anyone who is figuring out where to get their wedding invites done, go with Goutam of Perfect Invites. It would be among your best decisions that you make for your wedding! Thank you so much Roma! Amongst all the vendors I have worked with, Goutam was the easiest and most patient. He was quick at responding and had great recommendations whenever we were in a fix. He is a thorough professional who is enthusiastic about his work and also accommodating of his client’s demands. Thank you for our beautiful invitations and itineraries. Will definitely save them for posterity. This review is long overdue! 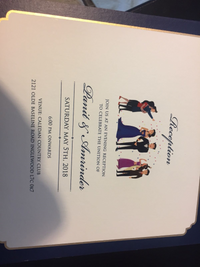 Thanks wedmegood for helping me discover perfect invites. Goutam seemed just the right person to work with for a person like me who was overflowing with ideas. We had lot of messages exchanged over watsapp so many changes before the final outcome but goutam was patient and a way creative! My wedding card was full of colors, life and so fresh that I was not getting over them. His idea of creating a card which shows the flow of functions was simply amazing. Thank you so so much goutam for giving me The perfect invite. Everybody just felt wow looking at my wedding card. Thank you and All the very best for the future. Ps: Goutam, If you have any professional picture of the card please do share with me. Thank you so much..and I'll share the card very soon! thank you so much rashmiita! www.Perfectinvites.in are AMAZING to work with and the wedding invite is absolutely beautiful! Right from initial order to proof approval to arrival, Goutam was very accommodating and Great. I highly recommend their services to anyone who is looking for quality and beauty. Thank you Goutam for a Wonderful work! I had a great experience with Perfect Invites! Gautam is very easy to work with and he created a beautiful invite for my wedding! I am very happy with the product and would definitely recommend it to anyone. Thank you so much Neti! Goutam was the easiest and most accommodating person. The design exceeded our expectations. Simple and Classic. I highly recommend him. Thank you so much Prashant! The Wedding Invitation was AMAZING to work with and the final product is simply breathtaking! The invitations are very reasonably priced, a great quality, responsive, attentive, understand, and delivered an overall impeccable package! I could not stop raving about how happy I am with the entire process/finished product. USE THEM! You will not be disappointed! We're absolutely thrilled about the wedding cards that Goutam has designed for us! He understood the brief very quickly and gave us some helpful suggestions on how to make it better. We've got great compliments from everyone on how elegant and unique our card is. From start to finish, Goutam did an extremely professional job. He's friendly, cooperative, quick, and just overall a pleasure to work with! After finding the venue which was a major task, next step was to get the wedding invites ready. I did rigorous search on the WMG app and found the best vendor -Perfect Invites. I wanted to customize everything and add the elements of Ooty into the mix. Gautham did a good job designing our wedding invitations. He made sure to take in client feedback and modify the designs; making sure to give his valuable feedback on the way. Keep the good work going! Goutam is the most patient designer I've met. 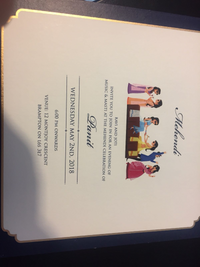 He gave us great input to get the core illustration of the invite right.. the invite was so good, that we decided to use the same design for the wedding website too.. Thanks a lot Goutam. Huge thanks to gautham for your patience and efforts you had put it in .Invite as come out very well and there is appreciation coming all around, regarding the card design . thanks a lot gautham . My fianc and I met Goutam only once to see his work in person. Every bit post that- right from selecting the design, paper, colours etc was all done on the phone and we must say that he heard us out patiently. Also, he was available for us at anytime knowing our hectic schedules at work. We had a concept in mind and the end product is exactly that! We love our cards and also the beautiful e-vite that he created at such a short notice. I would certainly recommend him to anyone who is looking for a patient, enthusiastic, creative, open to multiple ideas and suggestions kind of person! Thank You so much Goutam for being a wonderful part in our circle of life!! I met Goutam to enquire about how he could help me with my personal invites. It so happened, that he designed/ printed all the invites for my marriage (3 in all). His ideology is "make a very impactful first impression with the wedding invite, as inviting people is amongst the first things we do and making it special would set the tone for the entire marriage". He is professional, accommodative, creative and passionate. Me and my fiancee had a lot of things running in our minds, because we wanted the invite to stand out. Goutam showed lot of patience as he had to redesign the invite multiple times, and he did his best to incorporate all we wanted. Trust me, we kept adding/ deleting/ modifying the list of things we wanted in the invite. A very big thumbs up to his sketching skills. He designed a caricature, very much custom to our requirement in matter of hours. And it was just perfect ! After many messages, calls and emails exchanged, all our cards have come out very well and we are completely satisfied with the design, end to end delivery and the quality of our invites. His invites are a class apart and surely live up to his brand ?Perfect invites? !! First of all, I would love to thank Goutam for designing my wedding card just beyond perfect! They turned out to be super amazing. I was a little hesitant at first as he was from a different city. But as I spoke to him about my requirements, he gave me a dreamy card, including every little detail. He is soft spoken and easy to work! The design and paper quality is upto the mark. I couldn't have asked for anything more. Cheers!! Way to go Goutam. Thanks once again! ?? Having Goutam design our cards was 1 task less for us before the wedding .. ! He beautifully incorporated all the details we wanted in our cards .. following the beach theme .. He was patient enough to communicate with my fiance and me both who are based in different cities .. and just made the whole process very easy .. We absolutely loved our cards !! Of all the vendors we worked with for our wedding, Goutam was the most easiest and accommodating. He incorporated each and every detail I wanted in the invite, keeping it simple and fun as we would like. Also this time around the time difference did not matter to me since he delivered everything as we wanted and on time. He gracefully accommodated all my requirements and also created wedding signages out of the invites for us. He is professional as well as adds a personal touch to his creations. I cannot thank him enough. Thank You so much Amruta! Working with Goutam was such a seamless and stressfree experience. Everything was on time and all our requests were accommodated without any hesitation. Even though we don't live in bangalore it was incredibly easy to work with goutham and finalize the designs and get the cards shipped to us. Thank you so much Abinaya! Wow! Amazing! Lovely! Refreshing! So cool! Just some of the words that were said to me once I sent the beautiful evites Goutam designed for my wedding. Loved it, no one could have delivered the concept better! Absolutely amazing experience! Out of all my wedding vendors, Goutam has been most kind and accommodating. His designing is original and super pretty! I wanted a simple and chic card matching with the box I had already and he matched both of them perfectly. Even though we both are not in the same city, he was able to understand my requirement and did a fantastic job to deliver it within the promised timeline! Thanks to him I could skip all the chandni chowk card hunting and madness too! Thank you so much Rashi! Thank you so much Tamarra, it was a pleasure working for you.. Truly an amazing sketch artist. Professional and delivers on promises. Gautam was able to deliver exactly to my specifications and this was no small task. He went out of his way to ensure printing of hard copy cards were perfect. He has a magic touch to his works and recommend all you folks to reach out to him !! He will certainly make it big in this space. Good luck and thanks from the bottom of my heart ! Thank u so much Anisha it was a pleasure working with you.. Thank you so much Gaurav..